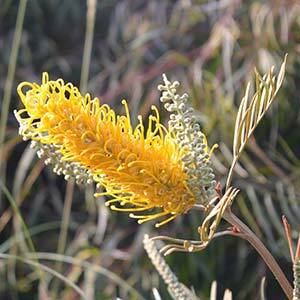 Grevillea ‘Bush Lemons’ With attractive golden yellow flowers Grevillea ‘Bush Lemons’ is aptly named. This is bit of a rarity as Grevilleas with large yellow flowers are few and far between. Bred by Richard Tomkin at Changers Green, ‘Bush Lemons’ forms a naturally rounded bushy shrub, the shape will be more compact if tip pruned from an early age. Typical of many Grevilleas, ‘Bush Lemons’ requires a sunny position in the garden with a well drained soil. In wet areas, try raising the garden bed a little to improve drainage. Lightly mulch around the plant each spring to provide protection and retain some moisture over summer. Water deeply every few weeks through the first summer, never allowing the soil to get soggy. Grevillea ‘Bush Lemons’ is very attractive to birds and insects, the brilliant yellow flowers that appear over long periods are an attraction in the garden. The warmer the climate, the longer the flowering period will be. Use as a feature in the garden border or plant in a row as an informal hedge. This is a low maintenance native shrub that can fit in with many landscaping styles. Grevillea ‘Bush Lemons’ Makes an excellent background plant in the garden border. Height – To around 3 metres in height. Spread – Will spread to 3 metres. Foliage – Mid to deep green, heavily divided. Soil – Well drained, humus rich with some moisture. Drought Tolerant – Yes, although mulch well to retain some moisture over summer. Frost Tolerant – Will tolerate mild frosts. Coastal conditions – Yes, although not suited to saline soils.